The OWI-536 All Terrain 3-in-1 RC Robot Kit - ATR - non solder is a multi-function tracked mobile robotic kit. 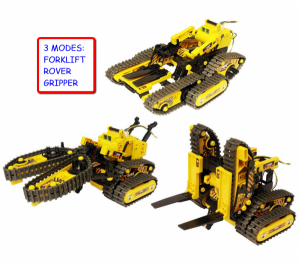 Utilize different track modules and make your robot transform into 3 amazing variations: the forklift, rover, and gripper. Using the remote wired controller, command the robot to move forward, backward, turn, grip and lift. In forklift mode, the ATR is like a mini industrial fork lift, with the ability to lift up to 100 g in weight. In rover mode, the ATR’s tank-like treads can traverse any type of surface. And in gripper mode, the ATR’s strong arms grab and pull objects into its grasp, lifting anything up to 100g and moving it to your desired location. This kit allows students to create and recreate: Put it together, take it apart, make another module…It’s all about flexibility, and intelligent thinking. But luckily, kids don’t have to be robotics engineers to create and achieve. With the 3-in-1 All Terrain Robot, they learn as they play.